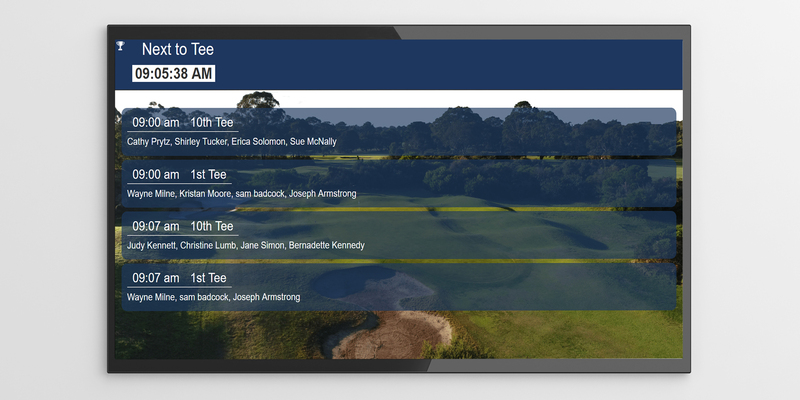 The MiClub call-to-tee feature displays member names and their scheduled tee-off time on a TV or monitor. This is easy to setup and a great addition to your club competitions! To set this up you will need a TV or display monitor in a location your members will easily be able to see. A good spot to setup would be at the clubhouse bar or pro-shop counter. To open the leaderboards and call-to-tee reminders on a TV monitor, we recommend using an ASUS VivoStick. This device plugs in to the HDMI input on the back your TV and functions as a mini-computer. You can then access the internet, login to your MiClub admin portal and create your leaderboard to configure call-to-tee reminders. 1. If you have a competition setup with players registered, open Leaderboards from the admin portal. 2. Click “Auto Leaderboard” Under Create/Edit Leaderboard templates to create a new quick leaderboard. 3. On your new quick leaderboard, click “Tee Times” to configure your tee reminders. 4. Set how many player rows to display on the screen in the “Quantity of booking rows to Display” field. This can depend on the size of your TV/monitor. If you select too many rows, your player names and tee-times may not be very clear. A good number of rows to display is 10. 5. Next you will need to configure the number of “Minutes before tee to start displaying”. If a player is scheduled to tee-off at 9:30am and you set this field to 30, your TV will start showing this player’s call-to-tee reminder at 9am. 6. Set the “Tee Reminder Grace Period.” This determines how long the tee reminders are displayed after the scheduled tee-off. If a player is set to tee-off at 9:30am and the grace period is set to 10, then the reminder will continue to display until 9:40am. 7. Choose how many seconds you want the call-to-tee to display between leaderboard results with the “Tee Reminder Duration”. This will need to be set to a multiple of 10. For example, 0,10,20,30 and so on. Displaying the reminder longer than 30 seconds is a bit excessive if you are also displaying competition results. We recommend sticking to 20 seconds maximum. 8. Select which booking resources to exclude. If you are just displaying call-to-tee reminders for a competition, you will want to tick and exclude everything except the resource you are using for the competition. 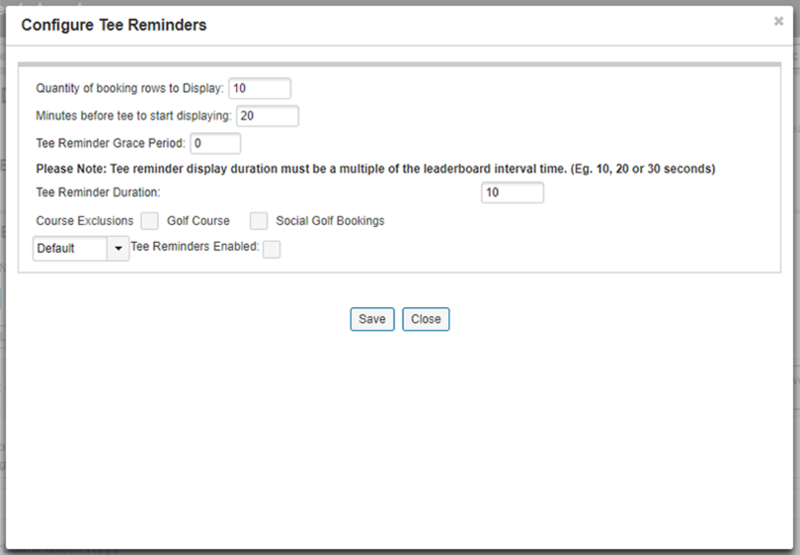 For example, in the above tee reminder configuration, we would tick “Social Golf Bookings” to exclude any social call-to-tee reminders. 9. Using the drop-down list which is set to “default”, you can change your leaderboard theme. Select a different setting from the drop-down list to display a different leaderboard background. 10. Tick “Tee Reminders Enabled” and then click “Save” to finish configuring your tee reminders. 11. Click “View” to display your leaderboard with call-to-tee reminders. Keep up to date with MiClub product news, industry trends, case studies and more. Enter your details below to receive MiClub news. You're signed up! Stay tuned for the next issue of MiClub Enews.